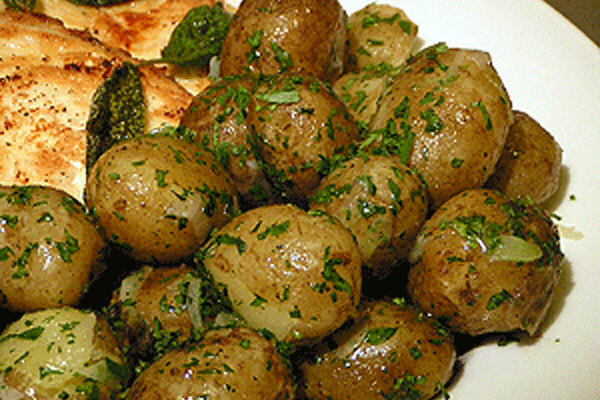 This is a nice alternative to plain steamed new potatoes. Although fantastic as they are try this for a change with my recipe for Parmesan Crusted Chicken Breasts. Here in the Nordic countries potatoes are almost a religion. 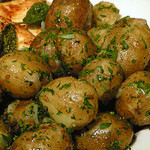 Small potatoes are available all year around. If you can’t find very small ones you can use larger ones, just cut them in half before you saute them. There are hundreds of ways to cook a potato!! That goes without saying but this is simple and easy. It goes with so many dishes both sauteed and roasted. If you are not an onion person you can of course leave out the spring onion. If using small fresh new potatoes scrub them with a small brush to remove any sand and dirt. Place them all in the basket of a steamer. Steam for about 15 minutes, start checking with the point of a small knife for doneness after the first 10 minutes. You don't want them over cooked. In a hot sauce pan or frying pan melt the butter and add the potatoes. Saute for a couple of minutes to remove any excess water from the steaming. Sprinkle over the chopped parsley and spring onion. Reserving a bit to decorate with with. Shake the pan vigorously to mix it all together. Give the whole thing a good hit of freshly grated black pepper and an extra large pinch of sea salt and serve. Like Swedes love their potatoes, I love these small new potatoes, they are the best. I can pop these like gummy bears. That says a lot coming from someone that would usually prefer pasta to potatoes. This recipe is good for when you need something that will add to a dish but not overpower the whole thing. Try them with my Parmesan Crusted Chicken Breasts. or a filet of some type of white fish such as cod (torsk). This will work with with most firm white fish and will do nicely with salmon (lax) as well. I prefer small new potatoes not larger than a golf ball. You can also use this recipe using olive oil to saute the potatoes in and then when done let them cool for a few minutes and dress them with my Sherry Tomato Vinaigrette or one of your own.